So we had a call from a man who wanted to be seen urgently. A front tooth had snapped off at the gum line and was causing great embarrassment in his business dealing with customers. 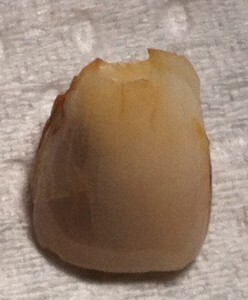 He brought in the tooth and asked (as you do) if it could be glued back on. The nerve of the tooth was intact, so the recommended treatment plan was to build up a pin retained core and place a Cerec porcelain crown, which could be done in about an hour. Unfortunately, the cost of the recommended treatment was prohibitive for this gentleman, so we decided to shape the core like a tooth made with composite material. This filled the gap, and can be used to support a porcelain crown in future so work is not having to be duplicated. It was emphasized, however that this is not a long term solution, and due to the flexing of composite material under load, eventually the bond to the tooth will break and micro leakage of bacteria could result in nerve problems. It is frustrating when patients opt out of the best treatment because of cost. Although there may be Plan B options available, patching things up as cheaply as possible is not the road to Great Teeth for life, and almost always lead to further problems sooner or later which could have been avoided if the best treatment option was taken initially.